Two down, one to go! The Griffeen Park and Cabinteely Park events are over: thanks to the planners and organisers of these two Tuesday evening events. 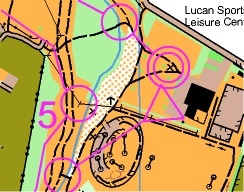 The final Tuesday evening event is in new territory for orienteering: Drumcondra on Tuesday 21st August. 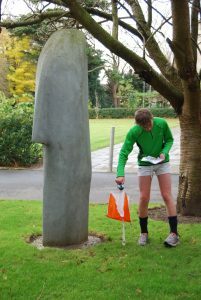 Registration will be in St Patrick’s College and the start and finish will be there. The long course will also visit the nearby Griffith Park. The Long course crosses a couple of (quiet) roads but beware of traffic. The courses will have lots of controls and be a bit like the sprint formal but a bit longer. The straight-line distances are about 1.6 km and 3.6 km but you’ll cover more ground than that. Start times 6.30 to 7.30 pm and courses close at 8.30 pm. Registration from 6.00 pm. Entry fees: Adult €6, Junior €4, Family €10. Parking: There is parking available in the College but don’t park in any of the “Pay by Text” zones unless you actually pay by text, or you’ll be clamped. These are to the front of the college so if you drive around the back you’ll be OK. Local roads typically have pay parking until 7 pm. Public transport is excellent, though: Buses 1, 11, 13, 16, 33, 41, 44 all pass the college. Drumcondra train station is about 10 minutes walk away. See the location map here. Reminder 1: The series of “Scatter” events starts on Sunday 2nd September at St Anne’s Park. Reminder 2: The next 3ROC event is our Leinster League at Clarabeg, LAragh, Co. Wicklow on 23rd September. Helpers needed!